FRONTLINE® Combo for Dogs provides fast, effective and convenient treatment and control of fleas (for up to 8 weeks), ticks ( for up to 4 weeks) and chewing lice for dogs and prevents all flea stages (eggs, larvae, pupae) from developing for 8 weeks after application. 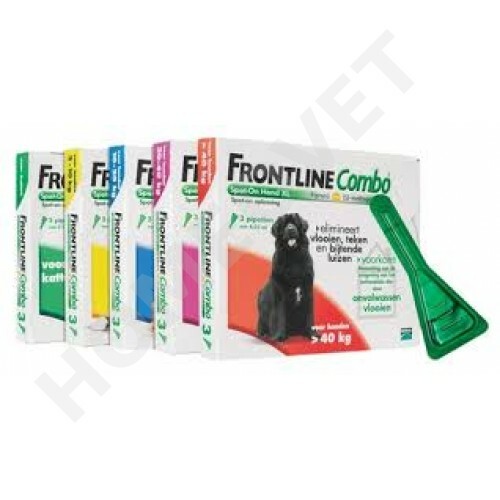 FRONTLINE® Combo for Dogs contains fipronil and the insect growth regulator (IGR) (S)-methoprene. Kills adult fleas (Ctenocephalides spp.) and insecticidal efficacy against new infestations with adult fleas persists for 8 weeks. Prevents all flea stages (eggs, larvae, pupae) from developing for 8 weeks after application. Kills all stages of deer ticks (which may carry Lyme disease) and brown dog ticks for up to 4 weeks (Ixodes ricinus, Dermacentor variabilis, Rhipicephalus sanguineus). Do not use on sick or healing pets. Only for use on dogs, do not use on rabbits, you could kill them. To ensure that you read the most up to date information about this product, please check the Ema (www.ema.europa.eu) or VMD's Product Information Database. 1 pipette of 4.02 ml (XL) per dog weighing over 40 kg. Weigh your pet and choose the correct size pipette for its weight. You can handle your cat or dog as usual as soon as the application site is dry. We advise that monthly treatment is recommended if there is an existing infestation, and/or during the higher risk periods, such as summer.